Big fish can live in strange places, and it can take a special drift boat to reach those waters. 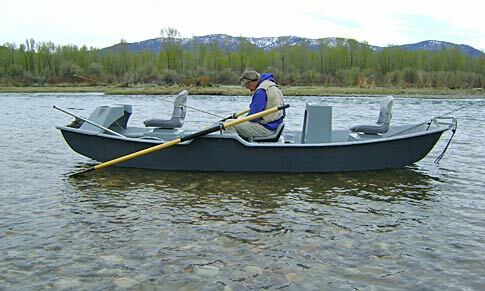 Enter the ClackaCraft HeadHunter II Skiff, designed with over two years of Clacka research and development. Along with extensive input from our Pro Staff and guides throughout the world, ClackaCraft has developed a versatile boat created for those waters that require a flat, low-slung drift boat that provides stealth and agility for times when it matters most ... when the "big boys" are on the feed. Whether you fish the rivers of southwest Montana, the North Platte of Wyoming or the Pere Marquette in Michigan, if the fish you chase live in small, tight,windy, or remote areas, the HeadHunter Skiff is the boat for you. Like its big brothers, the HeadHunter II Skiff comes well-equipped with dry storage, fly rod holders, removable front and rear knee braces as well as ClackaCraft's Exclusive GulfStream® bottom and Tunnel Hull Technology. Engineered to work harmoniously together, this design has elevated the “row-ability” of the boat to legendary status. 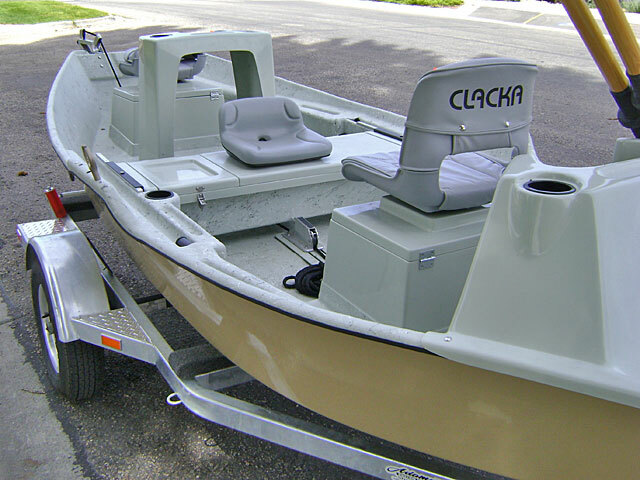 Features included on the ClackaCraft Headhunter ll GulfStream® bottom Tunnel Hull technology Integrated reversed rod holders Front knee brace Under deck storage Front and rear raised level floors Front storage box with slide rail system Rear lockable storage boxes Easy access interior side compartment storage Ergonomically designed foot brace Rower's bench with tractor seat (adjustable) Rower's bench storage (lockable) Rear knee brace Two swivel fold-down padded seats (3rd optional) Your choice of Anchor system Heavy duty bronze oar Locks Drain plugs Numerous beverage holders Your choice of colors 100 Year Guarantee against bottom punctures and leaks The ClackaCraft HeadHunter II Skiff is equipped with reverse rod holders as standard equipment.